THE BIGGEST EVENT OF THE YEAR, don’t miss it! Tucson’s most dynamic poets 18 & under rock the mic in a judged competition. The event will also feature a preformance by nationally-recognized performance poet Jessica Helen Lopez from New Mexico! 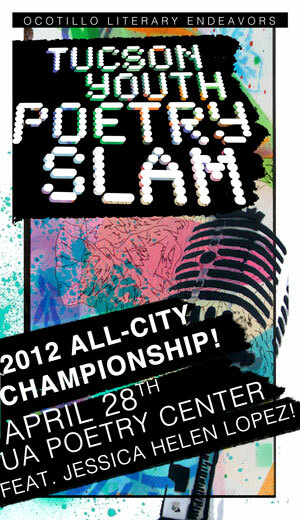 Who will be the 2012 All-City Champion? Made possible in part by the UA Poetry Center and the Every Voice in Action Foundation and broad community support. Check Jessica Helen Lopez on the far right side!